Eye On Sports Media: So is Rich Rodriguez Hispanic or Not? So is Rich Rodriguez Hispanic or Not? 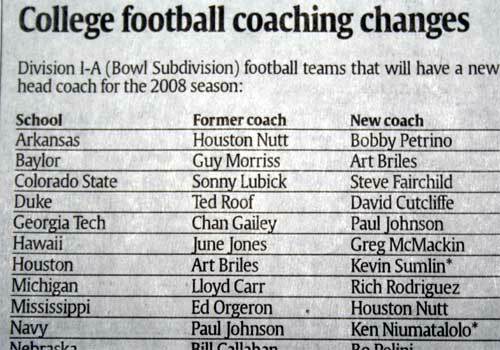 The asterisk next to the coach's name indicates that they are a minority coach. What caught my eye is the fact that Rich Rodriguez is not identified as a minority. Of course, one should never assume someone is an ethnic minority based on name alone, but his made me curious. Rodriguez is widely considered one of two Hispanic coaches in Division I-A football. Florida International's Mario Cristobal is the other. But the Black Coaches and Administrators excludes Rodriguez as a minority football coach, even though West Virginia considers him of Hispanic descent. "He's never considered himself a minority, or a member of the BCA, even though we've asked him to do that," BCA director Floyd Keith told the Birmingham (Ala.) News in October. "How they include him (at West Virginia) is fine. We would love to have included him in our numbers, but that's not his choice." This raises a fundamental question of what kind of pressure the BCA is applying, to their criteria. Rodriguez IS of Hispanic descent, and by definition that makes him a minority as defined by the U.S. Government. It only matters to the BCA is that he chose not to be a member, but why should he have to? The BCA website makes it clear, despite an occasional passing reference to ethic minorities. their mission os to promote the hiring of black head coaches and administrators. It is also troubling that USA Today has taken the BCA definition to identify minority coaches and not the definition of law. It is troubling that the NCAA seems to accept this definition as well. It seems that if a school or coach is not going to play by the BCA's rules, they will not be counted as having hired a minority coach. b. They are a member of the BCA. So if there is a minority candidate out there, black or otherwise, that has chosen to not belong to the BCA because they do not agree with its mission, or do not consider themselves black, the school will not receive credit for having conducted the interview. Take the case of University of Georgia Defensive Coordinator Willie Martinez. According to UGA Sports Information Director Claude Felton, he considers himself to be Hispanic. So he would meet the first criteria. But unless Coach Martinez, whose parent's are both Cuban and is Caucasian as it gets, belongs to the BCA, he will not be considered a minority. There is also another troubling part to this new NCAA policy. It is only focusing on the recruitment of head coaches and not assistant coaches. Unless it addresses this level, they are not truly addressing the need to develop a diverse candidate pool to draw candidates from for any head coaching vacancies. There also does not seem to be any place given to credit universities for diversity among assistant coaches. at UGA, 40% of the assistant coaches atre minorities (30% by the BCA rules if Martinez is not a BCA member), or efforts taken to increase diversity at this level. The bottom line is that the BCA has too much arbitrary power in defining who is to be counted as a minority coach. The bottom line is that the media, in this case USA Today, is buying into this in this chart and in other articles which only refer to black coaches. Unless the true definitions as set by law are used, the debate and controversy is false. And if the media continues to buy into the BCA definition, they are not filling their role as a watchdog. And a fundamental question is would not the BCA be better off renaming themselves "Minority Coaches and Administrators"? I think Rich Rodriguez is descended from a large group of Spanish immigrants to north central West Virginia in the early 1900s. The zinc mines in the region attracted many native Spanish citizens to the US. So many native Spaniards came to the area that there were Spanish-language newspapers published there. The Spanish givernment even set up a consulate in Clarksburg. If he is related to this wave of immigrants, he is about as much of a minority as any coach with an Italian or Irish last name whose family came to this country in the same time period. I have no concrete confirmation of his background; this conjecture is based on circumstantial evidence. a couple of people have discussed this with me via email. If this is the case, the pendulum swings the other way to ask why interviewers always bring up the minority reporting issue, and why WVU reported him as a minority (again, if that is accurate). This problem is not unique to college football coaching recruiting, but occurs in college faculty recruiting as well. At my university, we get monetary support for hiring black faculty, but not Hispanic, Asian, or American Indian faculty. I guess these aren't "worthy" minorities.